What do you do if you’re the leading manufacturer of wireless streaming multi-room products in the AV industry? As the influx of manufacturers joining this fast expanding area grows, you certainly can’t afford to rest on your laurels. 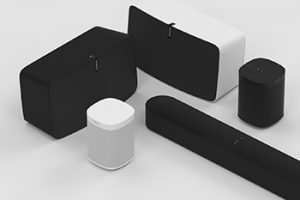 Sonos have never been a brand to idly release new products without a considerable amount of research and development so it’s a big occasion when they do. This, combined with their undeniable pedigree as the pioneering force behind the technology means that when a new line in their range is released, it’s enough for us to sit up, take notice and yearningly lick our lips in anticipation. 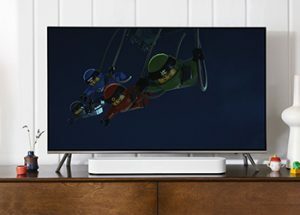 Whilst no one can deny the excellent reliability, performance and user experience that Sonos offers, one of the few chinks in its armour was that it didn’t have an entry level affordable solution for improving your TV’s sound. 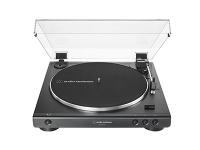 The Playbar and Playbase are both excellent performers but had lost out to other brands that offered less expensive equipment that delivered a lot of similar features. Now with the advent of their new Beam TV soundbar, Sonos are looking to nip that particular weak spot firmly in the bud. The Beam integrates easily with other Sonos speakers, making it easy to create a wireless surround sound system. At 65cm wide it’s significantly smaller than its older siblings and like the Sonos One speaker it has microphones mounted in its top panel, allowing you to issue commands with your voice via Amazon Alexa software and in the future Google Assistant, too. Like all Sonos products, one of the Beam’s best features is how seamlessly it works with existing Sonos equipment. 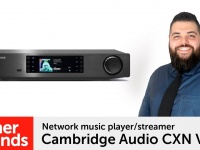 As with the Playbar and Playbase you have the option to connect a pair of Sonos speakers to act as rear speakers for surround sound and add a Sonos Sub for some extra low end wallop. The rear panel is the usual simple affair and contains an Audio Return Channel enabled HDMI connection, Ethernet port, wireless connection button and power socket. For older TVs that aren’t compatible with ARC an optical adaptor is supplied along with the HDMI lead, but only an HDMI connection to CEC enabled TVs will allow for voice commands to power on your screen, change the volume and allow you to control an Amazon Fire streamer. Four full range drivers and one tweeter (powered by five digital amplifiers) fire sound out of the front and sides in a wide dispersion whilst three passive radiators are placed at the rear to add some extra presence and body. Out of the box the first impressions of the Beam’s aesthetics are excellent. Clean contours and an understated logo on top of the fabric wrap around grille make it look very svelte. The Beam can be wall mounted with the optional bracket, but as it’s smaller in all areas than the Playbar, it’s a lot easier to accommodate in front of and under TVs than its bigger brother. It’s also less likely to block off your TV’s IR receiver and altogether looks a lot neater than most bars on the market. 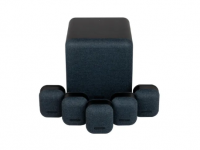 Set up is the usual breezy affair by simply following the brief set of steps on the Sonos app and, if you are an iOS user, implementing the Trueplay EQ system to optimise the sound for your room. 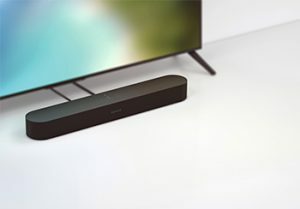 The first thing that we notice about the Beam’s sound is how much bigger and muscular it is compared to what we expected out of such a small soundbar. Watching The Martian on Blu-ray sees the intrepid astronauts attempting to flee the planet as their ship is caught in a dust storm and is the perfect example of how well the Beam balances weight, detail and crispness as the wind whips sand around the soundstage. There’s plenty of attack, but not to the point of harsh brittleness and the overall tonal balance means that we’re not using the app’s bass and treble control to adjust the sound. Compared to the Playbar it’s not quite got the same mid-range clout, but that’s a very small concern in the grand scheme of things. The sound is absolutely exceptional for the size of the unit. The Beam is available in both black and white. A quick flick over to Tidal and “Gone Cold” by American band Clutch shows that as with the Playbar and Playbase musicality hasn’t been forsaken when producing the Beam. The slinky brushes on the drums float over the bluesy acoustic guitar melody and give a nice sense of realism and organic-ness to the recording. If you switch to something more electronic though such as Jason Derulo’s “Want To Want Me” you’ll get power aplenty making the track bounce along with punchiness and drive making it nearly irresistible to tap your feet along. This sound quality coupled with the addition of Airplay 2 compatibility and the aforementioned voice control means there’s definite value for money in the Beam. So there you have it, with the Beam, Sonos have managed to bring their flavour of TV sound into a much more affordable price point meaning you can get five channel wireless surround sound for less than £700. Sure, if you tried placing it in a larger room you’d struggle to get the same heft that you do out of the Playbar, but that’s not the point of the Beam. At Richer Sounds Bristol we took plenty of preorders before it was released and it looks as though lots of people are going to be very happy that they were first in the queue to get their hands on Sonos’s best product in years. If you haven’t done already, make your way down to your local Richer Sounds location and hear it for yourself, you won’t be disappointed! 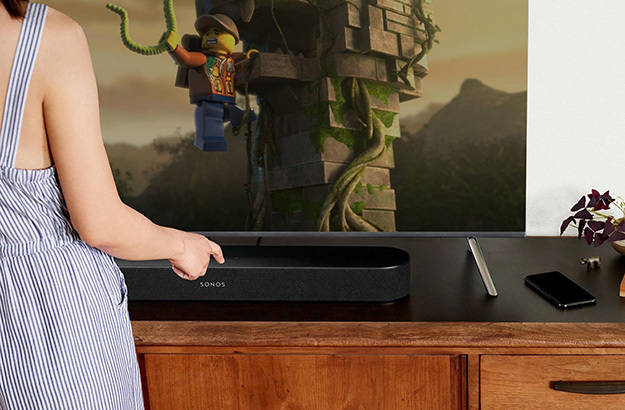 Click here to find out more about the Sonos Beam TV Soundbar. Sonos speakers are awesome, I have tried this with my Samsung 4K Smart TV.